Chinese Foreign Minister Wang Yi said Tuesday that China will move forward its cooperation with India, Pakistan and Mongolia. 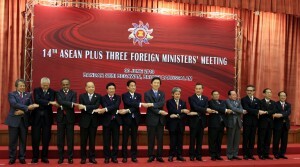 Wang spoke about the cooperation while meeting separately with his counterparts from those countries on the sidelines of the ASEAN Regional Forum (ARF). During his meeting with Indian Foreign Minister Salman Khurshid, Wang said Chinese Premier Li Keqiang’s recent India trip laid out the strategic plan for their mutual relationship. Wang said that the two nations should combine China’s strategy to develop its western region with India’s Look East policy, which would promote the integration of Asia and link both their markets – as well as most of Asia – through the Bangladesh-China-India-Myanmar economic corridor. Khurshid said Li’s visit was fruitful and said both countries should strengthen all kinds of bilateral mechanisms, actively back pragmatic cooperation, and remain coordinated on important international and regional issues. Wang also told Sartaj Aziz, the foreign affairs and national security advisor to the Pakistani prime minister, that China is happy to see that Islamabad completed a smooth transition of power. China is willing, Wang said, to deepen its pragmatic ties with Pakistan, especially on key cooperation programs, and push the strategic partnership to a new stage. Wang said China pays great attention to the upcoming visit of Pakistani Prime Minister Nawaz Sharif to Beijing and hopes to closely cooperate with Pakistan to make the visit a success. Aziz said the new Pakistani government will continue to steadfastly develop its all-weather friendly relations with China. He said he believes that Sharif’s visit will deepen and strengthen the traditional friendship between the two countries. Wang also met with Mongolian Foreign Minister L. Bold. The two sides pledged to deepen mutual cooperation and coordination in various areas.